Many congratulations to Chloe and Sam who were married at the gorgeous church of St. Mary’s Porchester on Sunday 20th May! Chloe has worked every Saturday as a team member at Proposals for the last three years and may have helped many of you choose your own dream dress. The gown was a specially designed Maggie Sottero fishtail style, in pale blush, with bespoke touches of sparkly tulle and crystals, it was teamed with a beautiful long veil and tiara. A pair of pale pink Jimmy Choo shoes completed the outfit to perfection. As the wedding was on a Sunday, all of the Proposals team (past and present), nine of us in total, were kindly invited to attend and we all had a wonderful time, dancing the night away until the early hours! The sun shone all day long and it was a really lovely occasion! We would all like to send our very best wishes to Chloe and Sam for a very long and happy marriage together! 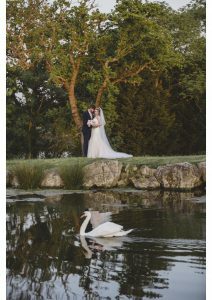 Chloe is now working back at Proposals, busily helping lots of other brides to help their dreams come true! Thank you both of you and good luck.